Small locals' pub tucked away down a side road off Borough High Street. 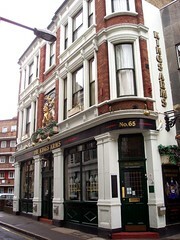 It's not to be confused with the inferior Old King's Head (also down an alleyway off Borough High Street, but further up towards London Bridge Station). It's comfortable inside, with carpets, some banquette seating as well as largish tables on either side of an L-shaped room that curves around the bar. It can get busy on weekday evenings just after work (but not so full that you can't nab a chair or two), usually plenty of room available by 8pm. Often frequented by Resonance FM types, the studio being a few seconds' walk away. There are three handpulls for ale, which in November 2009 offered Harvey's Sussex Best, Doom Bar and Flowers (in place of the regular Courage Best on that visit). There are also the usual Kronenbourg and other draught lagers. The service is extremely friendly and the food menu (mainly sandwiches) looks very reasonably priced indeed, but is only available at lunchtimes. Last visited by Ewan and friend, 20 November 2009. Last edited 2014-03-04 17:21:47 (version 12; diff). List all versions. Page last edited 2014-03-04 17:21:47 (version 12).